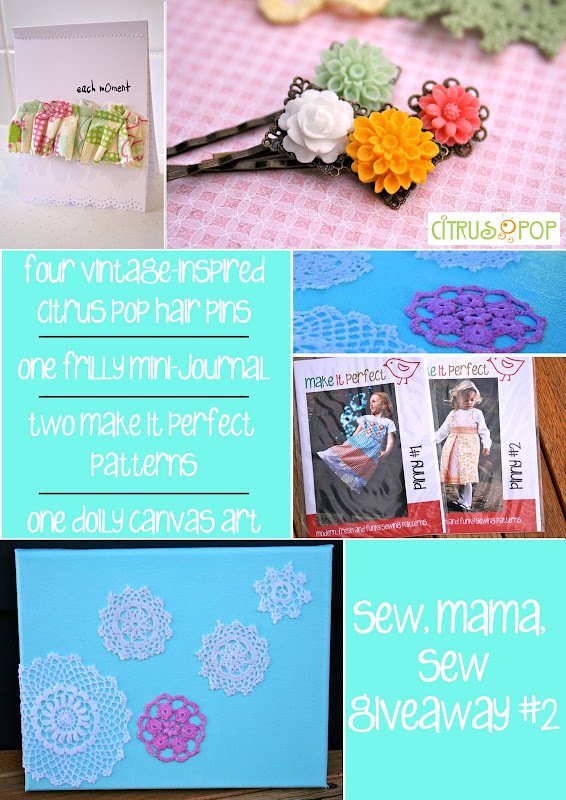 make it perfect: .Sew, Mama, Sew Giveaway Day #2. .Sew, Mama, Sew Giveaway Day #2. Oh my!!! Those hair clip are out of this world gorgeous. You're so talented. Brilliant. Please please please let me put those gorgeous hairclips in my hair. I need some prettiness desperately! Giveaways galore at the moment - so very generous! Loved your little tutorial for the zipper pouch, will try that when I get 5 mins spare! I'd really love to make those Pinny's for my little girl. I love those hair clips. I might go a see what I have make some of my own. You are so talented. Your stuff is so cute. I really hope I win one! These hair clips are gorgeous! Those are great hairclips. I wear bobbi pins in my hair every day, those would be great to jazz up my hair. Great giveaway! The hairpins are too cute, and I would love to make my little girls a pinny or two each! if I don't win, how can i buy those hair clips? Oh the doilies are beautiful. those hair clips are so beautiful and dainty! Thanks for the chance to win! I've always wanted one if tose hair clips. Ooh pretty. Thanks. Love it all, thanks once more for the awesome giveaway. love the hair clips!! I can't believe you have 3 giveaways hehe YAY for us!! Gosh - thank goodeness we can enter all of your glorious giveaways or I would be here for days just trying to decide! I LOVE those hair clips, my wee one & I fight over such pretties (I'm bigger mind, so I usually win...), but look... there... enough to share! those hair clips are SOOOO cute! So pretty!! What a fun giveaway! Wow Toni! I love those clips. So, so talented. It seems you can do and make anything. Another great giveaway - thanks so much! love this one too! THANK YOU! Goodness, more giveaways. Such generosity. Double the giveaways - double the happiness I say. Count me in. Hope I win won of these lovlies! These are such fun gifts. Thanks for the chance to win. I love these things, too! I just added your blog to my feedreader - I'll come back! Hope you jump over to my blog, too! Those hair pins are fabulous! The hairclips are so cute! ooOOooo I want those hairclips in MY hair!! You are so generous and talented! Greetings from Delaware. Those hair clips are beautiful!! These are just divine - with 3 girls we have no lack of hair to pinned!! Another brilliant giveaway - so generous! LOVE this! thanks for a fun giveaway! I love those hair clips!! I simply adore the Make It Perfect Sprout pattern. It couldn't be any cuter!!! I love love love those hair pins! Beautiful! Love the hair clip (my daughter will too!). Thanks for the chance to win! i LOVE the hair pins!!! Love them! HOpe to win! Love the citrus pop clips! My 22month old daugher got into her "pretties" (clips) last week and we still have several that are missing in action! These would be great replacements! Those hair clips are to die for! Oh man, 3 giveaways! Thanks!! Those hairclips are so nice! I really like those hairclips. I love those hair clips! I think I'd be saving those for me, not my girls! thanks for the giveaway! Oh those patterns! I'd love them!! I LOVE the hair clips and the patterns. If I win, I'll keep the hair clips for me, and use the patterns to make some cute dresses for my girls. Thanks for the chance to win. LOVE those hairclips. I'll be in need of some cute ones since I plan on going pixie this week! Oh my gosh! What a beautiful giveaway, thanks! love the hair clips, and well, all of it! thanks for the chance! You had me at hair clips!!! I love them!!! Yummy ! Oh I do hope I win... you are so clever and talented ! Oh, lovely! My hair could use the help from those gorgeous pins! your patterns are fantastic! i just got one and can't wait to find time to bust it open! everything you make is so wonderful! This one looks so fun. Thanks! Wow... another GENEROUS giveaway. Please enter me. I know just the person who'd love the clips. I love love the hair pins!! Thank you! What gorgeous things you make. I love those hair clips!! How wonderful of you to join the give away! ahhh! those hair pins are TOO cute! Those clips are worth growing my hair out for! I really like the hair clips! What a great giveaway. I adore hair pins like that! Thanks for the chance to win! I love the hair clips! Thanks for the great giveaway! My daughter would LOOOOVE those hair clips! Wow, I am coveting those patterns! And the pins are so lovely! Thanks for the opportunity! I am in love with those hair clips - they would look so perfect with my new pixie crop! the hairpins are so pretty! Could those hair pins BE any sweeter?! those hair clips are gorgeous and even I would wear those (me with a short short pixie cut). These are so amazing! I'd love to win you are so talented! i love the hair clip. love the hair clips! the patterns are lovely too! You are very talented! Please count me in this giveaway too! ^^ thank you!! I am loving your patterns! I love the hairclips. Thanks for the opportunity. The hair clips are to die for! They would look adorable on my daughter. Those hairclips are great! Can't believe you're doing 3 giveaways!!! great! thanks for the chance to win! Beautiful hair clips and such a lovely giveaway, thanks. Those hair clips look like sugar flowers. love them! The clips are really cute. Really neat hair clips! Thanks so much for the chance!! I love the flower clips! Adorable! Thanks for the chance to win! the pins are so cute *_* would love to win it! The hair clips are adorable! all of your giveaways are great! I would love to win! Thanks so much! The hairclips are gorgeous and I'll love to make the pinnies for my girl. Thanks for the giveaway! lovely hair clips. I could wear them now. Wow! So many great ideas--love those hair pins! Thanks for the chance to win! Did you make the hairclips? THey are awesome! Where do you find the time? Oh my gosh, I love those hairpins!! I want to win all your giveaways! Such cute stuff! Toni you are a creative genius! I didnt know you were so clever! I love it all! Wow! Those clips are spectacular! And I'd love to make either of those patterns up for my girls, when I find time after this baby arrives and if I can find the perfect fabrics! I love those hair clips! I love these patterns and have a special little girl for the hair clips. Ooh, it's all so lovely! I love the hair pins. Thanks for the chance to win. Love the doily canvas art! Thanks for hosting such lovely giveaways - I'm entering all three! OK...I need those hairclips!!! How divine!!! I love the hair clips - and so does my daughter!!! Those hairclips are simply yummy!! Such generosity, thanks for the giveaways! I'll be sure to follow your blog. Those hairclips are lovely! Thanks for your generous giveaway! I love your doily art and your hair clips. Sew Creative, I love them. I would love to win anything--I'm always inspired by your work!